My favourite gardening magazine is The Gardener (South African Magazine). The February issue has just arrived in the shops so I got it today and as always it is packed full of interesting articles and information. Its perfect for a novice gardener like myself because there is so much to learn. Their blurb goes “We know South Africans love their gardens! This magazine inspires the home enthusiast with practical ideas for maintaining and enhancing their gardens, patios and backyards. New plants and products are mentioned first in The Gardener and there is also a special focus on indigenous gardening in South Africa“. 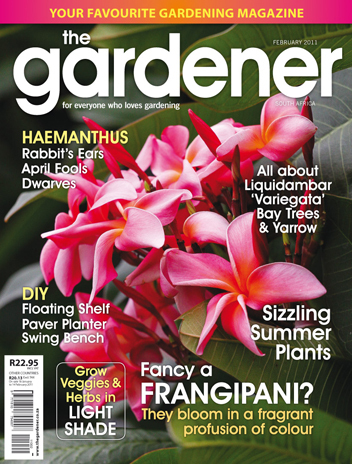 This month they have a feature on Frangipanis. A gorgeous 4 page spread that makes me want to rush out and buy one of these beautiful trees. I have one in my garden – it has yellow flowers and fills the front garden with the most wonderful scent in spring, but oh … I so badly want one of these pink ones like they have on the cover. Isn’t it beautiful? There is a very useful article on growing veggies – with a section on which veggies to grow in shady areas. That was very useful for me because the spot my veggie planter is going to be positioned in does not get full sun all day long. So good to know what I can expect to produce. As always it has a full article on what we should be doing in our gardens next month (February) – also useful to have for Mrs Black Fingers here!! All in all this is a fantastic magazine – of all the gardening mags I’ve bought this is my favourite. I really like this mag too. I think its the best in SA.